Sony has launched an advertising campaign tying in with the James Bond Quantum of Solace movie. 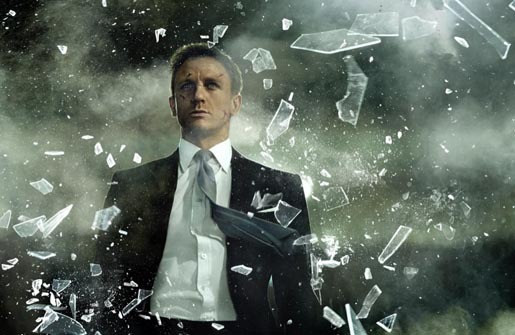 The television and cinema advertisement, launched on October 15 in the UK, shows Daniel Craig as James Bond, attempting to stand still for the camera, despite the spectacular explosions occurring behind him. The 60 second commercial finishes with a close up of Bond’s face and cuts to a selection of Sony screen devices and the words, “Bond in Sony High Definition”. As part of the film tie-up Sony is launching an official 007 Vaio laptop, called the Bond Z Series, in selected stores. The television and cinema ad is being supplemented with print advertising with in-house displays wherever Sony products are sold. “Sophistication, quality and international appeal make James Bond a perfect fit with the Sony brand,” said Andrew House, Chief Marketing Officer, Sony Corporation. “This is the first time we have integrated our film and electronics marketing efforts at such a deep level, bringing together Sony’s leadership in high definition with one of the world’s most powerful movie franchises. Sony is unique in its ability to create a global marketing campaign that combines technological innovation with entertainment content in this way. The Quantum of Solace campaign was developed at Fallon, London, by executive creative director Richard Flintham, art director Graham Storey, copywriter Phil Cockrell, planners Heidi Hackemer and Matt Springate. Filming was shot by Baillie Walsh via Home Corp with producer Josh Barwick. Footage was produced especially for the advertisement and does not appear in the film. Editor was Struan Clay at Final Cut. Post production was done at The Moving Picture Company and at Asylum Models & Effects, London, by VFX supervisors Mark Mason and Mark Curtis. Stills were by photographers Warren Dupreez and Nick Thornton Jones. Audio post production was done at Wave Studios by Parv Singh. Original music was composed by Parv Thind and Vimal Singh. Media was handled at OMD by media planner Rupert Holroyd.